Some days ago I felt like redecorating my room. There was a large poster on one of the walls which I wanted to replace by another one. I started looking for poster of bands and musicians I like. But either I found nothing at all or the posters were much to small (I wanted it to be A0, which is approx. 120 cm × 84 cm). So I thought, why not designing my own poster and printing it out. A few months ago I found a software called “Rasterbator” which divides a large poster into single pages which you can then print out with your own ink or laser printer. There are a lot of impressive pictures from posters people did that way on the Internet. Just look for “Rasterbator” at your preferred search engine. Anyway, I thought I could design a poster myself, print it out and put it on the wall. If I made it as a vector graphic I could scale it to any size and print it as large as I wanted. So all I needed was some design which represented music, because that’s what I wanted to be on the wall. I started to play with a note, but didn’t come far. So I looked for a vector graphic of a treble clef which I could use. I found one, did some arrangements, two versions (one white, one black), and you can see what the result looks like. Now that the poster is ready, I release it into the public. If you like it just print it out yourself. If you want to use it as a basis for your own poster design, feel free to do so. Creative Commons makes it easy. Here are some files you might want to download. I made both posters in A0 (1188 mm × 840 mm) and A1 (840 mm × 594 mm). You can choose between the normal and the rasterized version. 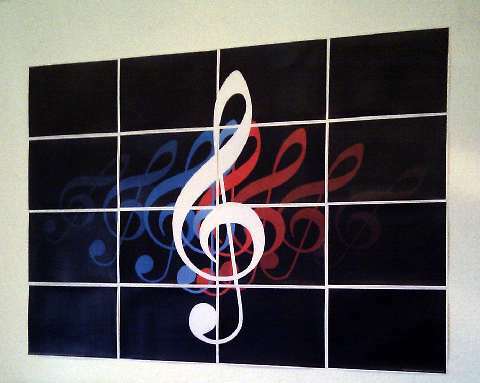 The poster “Treble clef” is licensed under a Creative Commons Attribution Share Alike 3.0 License. This regards the PDF-files and the Scalable Vector Graphics source SVG-files. 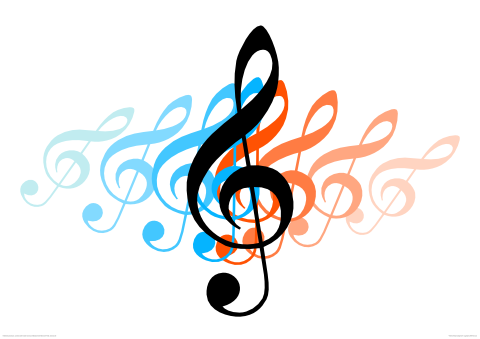 It uses parts of the image “Bass and Treble clef.svg” by “Lthown” which was published under a Creative Commons Attribution 3.0 License. I am a member of my high school’s choirs, Manchester High School of Chesterfield, Virginia. Recently we were working to redesign our t shirt logo and because our school colors are blue and orange, your design worked perfectly. I wanted to inquire about purchasing rights to use your design on our chorus t shirts. Your name and credits can certainly be on the shirt, and I want to thank you for such a wonderful design. 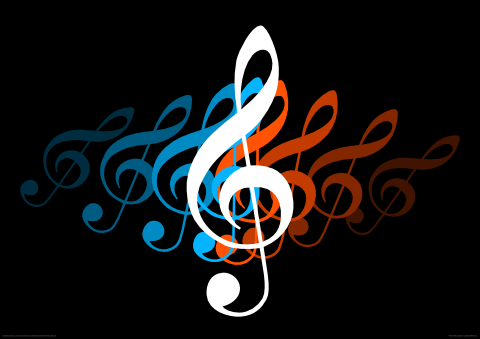 interested in using my treble clef poster design for choir T-shirts. When it comes to my work my philosophy is “sharing is caring”. licenses which allow everybody to download and share it for free. name printed on my T-shirt. What’s the point? Virginia, for an unlimited time and free of charge.